According to Mayan legend, tortillas were invented by a peasant for his hungry king in ancient times. The first tortillas discovered, which date back to approximately 10,000 BC, were made of native maize with dried kernel. The Aztecs used a lot of maize, both eaten straight from the cob and in recipes. They ground the maize, and used the cornmeal to make a dough called masa. Excavations in the "Valle de Tehuacan" in the state of Puebla, Mexico have revealed the use around 3000 BC of the basic cereal, a small, wild cob, eaten by native people. According to Agustín Gaytan, chef and Mexican Cuisine historian, in a Greeley Tribune newspaper article. Sometime about 3000 BC, people of the Sierra Madre mountains in Mexico hybridized wild grasses to produce large, nutritious kernels we know as corn. Mexican anthropologist and maize historian Arturo Warman credits the development of corn with the rise of Mesoamerican civilizations such as the Mayans and the Aztecs, which were advanced in art, architecture, math and astronomy. The significance of corn was not lost on indigenous cultures that viewed it as a foundation of humanity. It is revered as the seed of life. According to legend, human beings were made of corn by the Gods. By the time Spaniards reached the shores of what is now Mexico in the 1400s, indigenous Mesoamericans had a sophisticated and flavorful cuisine based on native fruits, game, cultivated beans and corn and domesticated turkeys. On April, 22 1519, Spaniards led by Hernan Cortes, also known as Hernando Cortez, arrived in what is now Mexico. They found that the inhabitants (Aztecs and other native Mexican peoples) made flat maize bread. The native Nahuatl name for this was tlaxcalli. In Cortes' 1520 second letter to King Charles V of Spain, he described the public markets. This city has many public squares, in which are situated the markets and other places for buying and selling. . . where are daily assembled more than sixty thousand souls, engaged in buying and selling, and where are found all kinds of merchandise that the world affords, embracing the necessaries of life, as for instance articles of food. . . maize or Indian corn, in the grain and in the form of bread, preferred in the grain for its flavor to that of the other islands and terra-firma. This bread made from maize was later given the name tortilla (little cake) by the Spanish. In parts of southern Spain, the origin of many of the Spaniards conquering America, a tortilla or tortillita is a crisp, thin, circular, fried cake made of chickpea meal. These tortillas, which apparently have their roots in southern Spain's Arabic heritage, look strikingly similar to the fried maize tortilla (or tostada). In 1529, Franciscan friar Bernardino de Sahagun was sent to New Spain (Mexico) to compile a compendium of all things relating to native history and customs that might be useful for Christianizing the Aztecs, named "Indians" by the Spain conquerors. This took some seven years, in collaboration with the best native authorities, and was expanded into a history and description of the Aztec people and civilization in twelve manuscript books, together with grammar (Arte) and a dictionary of the language. In his extensive manuscripts, General History of the Things of New Spain (Historia general de las cosas de Nueva Espana), Sahagun described how the Aztec diet was based on maize, tortillas, tamales and a wide variety of chiles. He compiled and translated testimonies of his culinary informants from the native language of Nahuatl into Spanish. His work is the most complete record of Aztec foods and eating habits, and he is considered one of the fathers of culinary history. Traditionally, maize tortillas were made from nixtamalized maize, kernels were soaked in a solution of lime (calcium hydroxide) and water to remove their skins, this also increases the bioavailability of then unknown niacin. The grains were then ground into maize dough (masa). A golfball sized piece of dough was patted down by hand into a thin pancake shape, placed on a hot griddle (comal), and cooked on both sides. This tortilla making process is still used today in southern Mexico. To meet the needs of big cities and the modern lifestyle, the traditional process was mechanized to increase production of tortillas. In the 1940s and 1950s, one of the first widespread uses of small gas engines and electric motors was to power wet grain grinders for making masa. A hand press or hand patting were still used to form it into tortillas, but by the 1960s, small scale tortilla making machines could produce cooked tortillas every two seconds. In skillet, over medium heat, add ground beef, cook until brown. Add onions and bell peppers, cook until tender. Then add, taco seasoning mix, salt, pepper, diced tomatos, green chilies, tomato sauce and black beans. Stir well. Preheat oven to 350 degrees. Spray 9x13 baking dish with nonstick cooking spray. Add thin layer meat mixture to bottom of pan. Add 4 flour tortillas, add meat mixture, onions and peppers, sprinkle cheese. Repeat layers, ending in cheese. Cook about 15 minutes or until cheese has melted. Enjoy! Great food and a whole lot of great information thanks! My hubby would go nuts for this! I need to make more Mexican foods for him. This looks like a good start! Have you tried to make home-made tortillas? I always enjoy reading the history you share! This taco looks so colorful and filling. Oh wow, this looks Christine! I love that you added black beans to this. They are one of my favorite beans. Definitely making this soon! Love this idea! 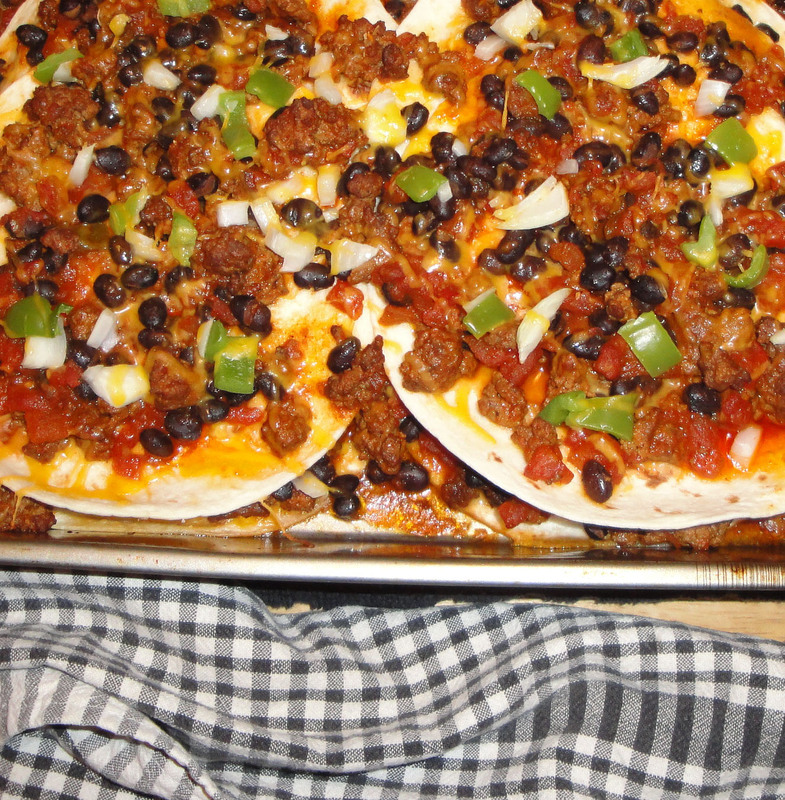 I make a Mexican Lasagna which is along similar lines, I guess, and yet quite different too. Great history....I've always wanted to make tortillas by hand. I have a HUGE list of things to make! I just finished breakfast but I could make room for some of this. This looks so good! I love enchilada casserole; have never done it with tacos - will have to try it out. I once made meatballs with taco meat and rolled those up in crescent rolls - that was a yummy take on tacos too. No, I've never made homemade tortillas. Meatballs with taco meat and rolled those up in crescent rolls sounds good. I love taco casserole, and this sounds like a great recipe! Thanks for sharing! Love the history on tortillas! Great looking taco casserole! Anything with chile and cheese gets my attention. Love all the history on this one!! This looks like one yummy casserole! Looks delicious, Christine! I need a fork!! 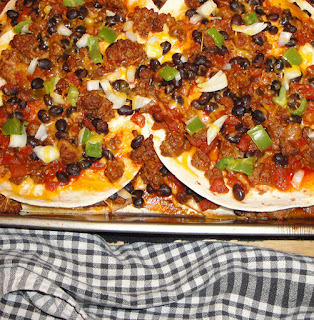 I call these Mexican pizzas. I love tortillas. I always try to have them around for dinner and lunch options. Great history!